Hand Readings of famous people: How much better is Mohamed Morsi as compared to Hosni Mubarak? How much better is Mohamed Morsi as compared to Hosni Mubarak? changeable. Not good qualities in a leader. Unreasonableness is shown, as is idealism, and these two qualities are not a good combination. Plus, the Jupiter mount and finger shows a desire for power, and manipulative tendencies. The manipulativeness was not present in his past self as seen from the left passive hand, but has developed, and that too quite well in the right active hand. The Headline too is much better in the left passive hand, more stable and more even. Morsi's right active hand, which shows his current self is not a hand belonging to a straightforward and rational person. Check out a hand photograph of Morsi here. Hosni Mubarak has a better hand in one sense because of his strong clear Headline which shows stability of ideas. But the thick, slightly high-set thumb held close to the palm, the developed lower moon and fleshy hand tell a different story. They tell us of someone who is stronger, but is also quite headstrong, very unreasonable, and also more selfish. The hand is of a person who is secretive and as his head dominates his heart, he can be ruthless if he deems it necessary. His hand also shows materialism to the end of this days. Not the hand belonging to a benevolent dictator. A hand photograph of his can be seen here. Mohamed Morsi’s hand shows a greater humanitarian approach, and a materialism which keeps decreasing as he grows older. However, his headline shows confused thinking and is not strong enough to enable him to carry out his ideas. His hand does not show him to be a bad man but one cannot help but wonder whether this hand belongs to someone who is mentally strong enough or rational enough to take on the mantle of Egypt’s leader. 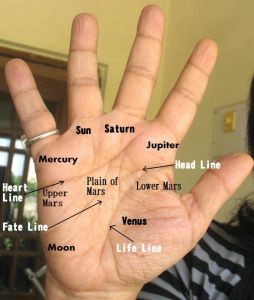 Your might also like Nelson Mandela's hand reading or Muammar Gaddafi Hand Reading or Jacob Zuma's hand analysis or check out the hand readings of Heads of States from all over the world. So, is he better? I have developed healthy disregards for so-called leaders. We always talk in terms of is this leader less-worser than the other one, rather than is this leader good. A very bad judging-scale for selecting a leader, really! We live in the modern world but yet civilized people are unable to get elected! And then it comes down to who is the lesser evil, unfortunately.